Heterocyclic compounds are the cyclic compounds having at least one atom other than carbon as a ring member. The most generally encountered heterocyclic compounds have only nitrogen, oxygen and sulphur as the hetero atom. Heterocyclic compounds have been found to be very reactive. Heterocyclic intermediates have been employed more and more in synthesis as the protecting groups. In the biological world, they are everywhere, for illustration, chlorophyll that makes leaves green in plants and heme that is responsible for making blood red in animals are significant heterocyclic compounds. Some of the heterocyclic rings are though not considered as heterocyclic compounds due to the relatively instability of their ring systems and lack of aromatic character. For illustration: Epoxides and γ- or δ lactones. The introduction of hetero atom in the ring in place of carbon doesn't modify the strain relationship considerably. The most stable heterocyclic compounds are those containing five or six membered rings. Heterocyclic compounds are therefore stated as those compounds containing five or six membered ring, by at least one hetero atom as the ring member that are comparatively stable and show aromatic character. They are considered as being derived from the benzene by substituting a C=C through a hetero atom by an unshared electron pair. For illustration: furan, thiophene and pyrrole having O, S, and N correspondingly as hetero atoms. 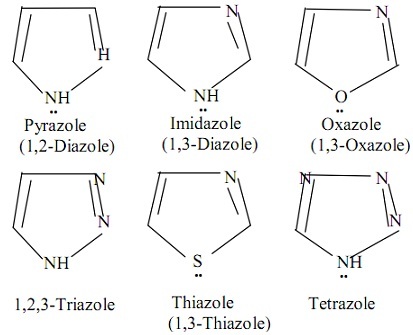 The two hetero atoms might be similar, as in pyrazole and imidazone or different, as in the thiazole and oxazole. a) Compounds with one hetero atom: For illustration: pyridine, pyran and thiopyranete. b) Compounds with more than one hetero atom: For illustration, pyrimidine, pyrazine, pyridazine and so on. 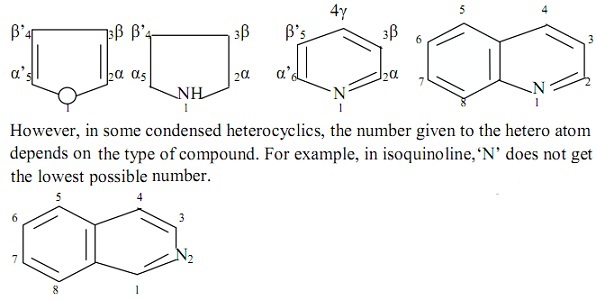 They might comprise of two or more fused rings that might be partially carbocyclic and partially heterocyclic, example: Indole, quinoline, carbazole or might be fully heterocyclic eig purine, pteridine and so on. They might be categorized into two classes based on their properties. a) Heteroparaffins: They look like paraffin. Example: tetrahydrofuran (THF), pyrrolidine, piperidine and so on. b) Hetero aromatics: They look like aromatic compounds. Example: pyrrole, thiophene, furan, pyridine, indole and so on. Heterocyclic compounds are usually identified by their common names. The IUPAC system has accepted most of the common names. Though, the IUPAC system of naming is still employed. The IUPAC name of heterocyclic is obtained through combining the given prefixes and suffixes in the table shown below. If more than one hetero atom is present, then the prefixes are positioned in order of seniority that is, 'oxa-' first then 'thia-' and so on. The simple Heterocyclics having one atom are numbered in such a manner that the hetero atom obtains the lowest possible numbers and the numbering is carried out in anti-clockwise direction. The ring positions are designated through numeral or Greek letters. Whenever Greek letters are employed, the position next to the hetero atom is designated as α- followed by β- and so forth. If two or more hetero atoms are present, the numbering is done in such a way that the hetero atom higher in seniority obtains the lowest number. For illustration 'O' takes precedence over 'S', and 'S' over 'N' and the other hetero atoms get the subsequent number.